And with that, Star Wars snapped the Internet in two once again. At the conclusion of the Star Wars Episode IX panel at Chicago's Star Wars Celebration, director J.J. Abrams and producer Kathleen Kennedy introduced the first teaser trailer for the upcoming sci-fi epic, which also went on to reveal the film's title. It's a pretty far cry from the most common guesses bandied around online by fans and "leaks" - such as The Last Hope - and though it doesn't immediately roll off the tongue, it'll likely be a grower in the coming months. As for the teaser itself? 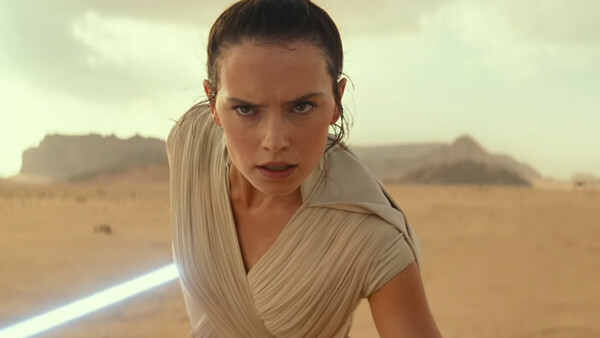 It typically didn't give much away, focusing on Rey (Daisy Ridley) taking up Luke Skywalker's (Mark Hamill) quest to battle Kylo Ren (Adam Driver), with brief glimpses at most of the principal players, including a returning Lando Calrissian (Billy Dee Williams) and General Leia (Carrie Fisher). The big kicker, though? The end of the trailer appears to reveal that The Rise of Skywalker will reintroduce Emperor Palpatine (Ian McDiarmid), as indicated by both the ruins of the Death Star and his signature evil cackle. Also, McDiarmid then appeared on stage, urging the trailer to be played again in his finest Palpatine snarl.